If you are part of a 4 or 5-person family, then the perfect accommodation for you is the Prestige Premium Chalet 4/5 pers at Sunêlia Les Pins ****. With two bedrooms, one master and the other with three single beds including a bunk bed, you’ll feel right at home. So that you feel completely comfortable, our chalets have full amenities: kitchen with refrigerator, stove, microwave, dishes, etc. There is patio furniture on the terrace. 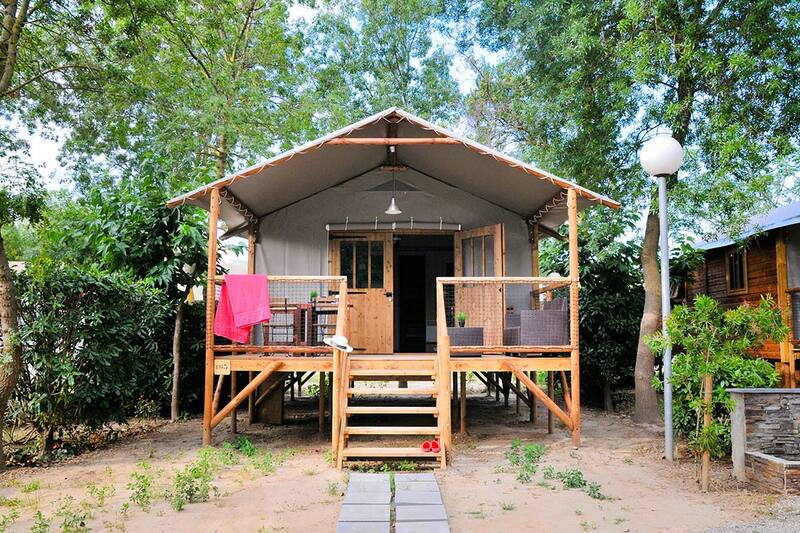 You will be very comfortable there, where you can strengthen your bonds with loved ones and reconnect with nature! Important : We refuse access to families presenting themselves with a number of participants exceeding the capacity of the rented accommodation. 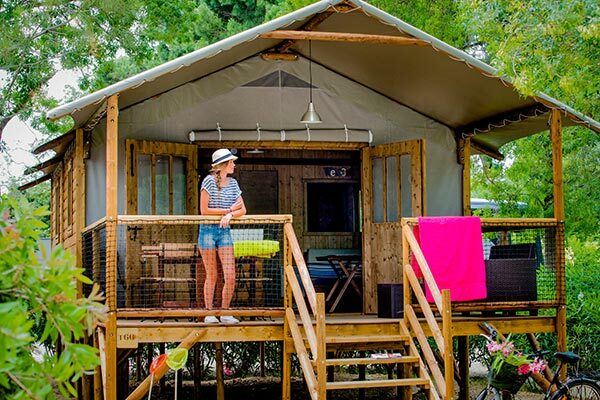 Camping Les Pins is committed to welcoming all groups of holidaymakers and offers two chalets specially designed for large families and groups. Choose between the Prestige Premium Chalet 5 people and the Prestige Premium Chalet 7 people. By booking the Chalet Prestige Premium 5 persons, you will be able to enjoy a comfortable stay in an accommodation with 2 bedrooms (one bedroom for a couple and one bedroom with 3 beds), a lounge with breakfast table and bench, a kitchen equipped with all the necessary appliances and a covered terrace, also serving as a garden furniture. Chalet Prestige Premium 7 persons has 3 bedrooms (one room for 3 persons and two parental bedrooms), as well as a similar living room and kitchen. The two Premium Chalets have a bathroom with shower and separate WC. Do you want to test the stay in a cottage by the sea? All wooden, protected by unbleached canvases and built on stilts, the Chalets Prestige d’Argelès-sur-mer combine an architecture with rustic charm and a cosy interior equipped with all the modern comforts: household appliances, bedding, linen… Real small holiday homes as close as possible to nature, which allow you to experience a pure moment of disconnection and relaxation. Explore the surrounding nature, observe the stars from the terrace, indulge in a moment of meditation… The fullness and return to the roots are within your reach. Dare to have a different holiday by booking the Premium Chalet of your choice for your stay in Argelès-sur-mer without further delay!